Our first stop Saturday was downtown Medicine Lodge, where we enjoyed the Indian Summer Western Art Show and sampled a few homemade treats along Main Street. Remembering that Carrie Nation, a colorful hatchet-wielding member of the Temperance Movement, lived for a time in Medicine Lodge, we decided to tour her home and museum. Michael and I proceeded to pepper a museum volunteer with questions about Carrie and, of course, the volunteer was gracious and knowledgeable. We then stopped at the Medicine Lodge Stockade where we were entertained by a traveling medicine man show in the courtyard. Always wanting to try locally owned restaurants in our travels, we found the delightful little Amics Mediterranean Café and Tapas Bar in McPherson. Our dinner there was delicious and the service, impeccable. Sunday morning we went to the Scottish Festival and handed out Faces & Places Tour t-shirts and took a lot of pictures of guys in plaid skirts. Thomas Leslie Huxtable, a patriarch of the Leslie Clan, was kind enough to explain the Scotsman’s attire. He noted that pleating to the sett maintains the plaid pattern or tartan even across the pleats. Pleating to the stripe is common for members of the military and emphasizes the horizontal bands of the tartan across the backside. 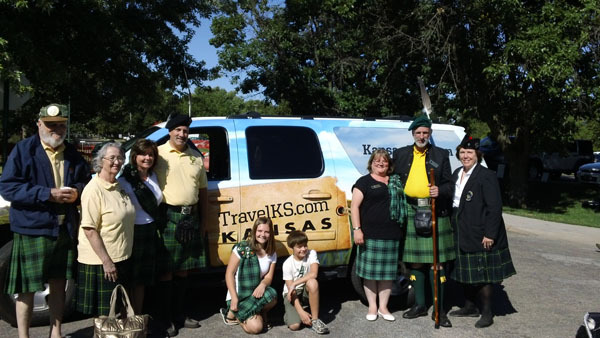 While at the festival, we were introduced to the very tall chief of the Arthur Clan who, along with his wife, flew from Scotland to attend McPherson’s Scottish Festival. You could tell he was a big deal because he had a huge feather in his cap! While my husband tried haggis, I settled on some shortbread cookies. Pretty safe bet on the cookies, as they were beyond yummy! On our way back home, we stopped in the quaint Swedish town of Lindsborg and visited the Old Mill Museum. We then had a bite to eat at the locally owned Swedish Crown Restaurant. While you’ll find many great things to do and see across the state of Kansas, I think it’s the people you come into contact with that makes such trips memorable. Tracey Stratton has worked for jones huyett Partners in Topeka for nearly 5 years as Director of Public Relations. She and her husband, Michael have four teenage children. On the off chance she has spare time, she likes to read and attend KU football and basketball games.